Marble benchtops, similar to granite ones make a style statement but with its softer tone. We being the largest marble benchtops supplier in Perth, promise you a brighter looking kitchen when you choose from our collection, comprising of lighter shades and uber-chic colours. So place your orders for these graceful additions and let your cosy kitchenette appear airy and refreshing. 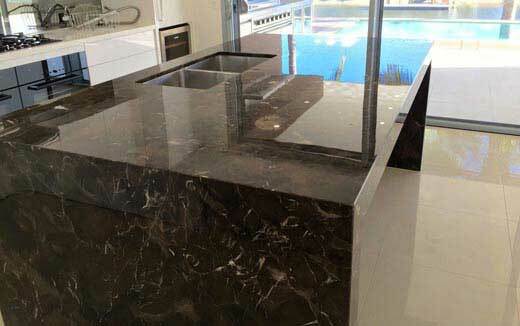 At West Coast Marble & Granite, our marble benchtops are not just aesthetically appealing but also great in terms of application. There’s no scope for it getting damaged even when you place a hot pot on it. These have an inherent resistance to heating, making them an ideal option for baking and cooking. Besides, these benchtops even fit a master bathroom, be it a transitional, contemporary or an industrial one. Regarding selection and installation, there’s no place for worries, as our experts are here to assist you with the right shade. Furthermore, as our specialists are acquainted with the material’s characteristics, they will always ensure that you make an informed decision every time you place an order.